Manufacturer of a wide range of products which include 1000x magnification skin camera, 1000x usb video dermatocope camera, 200x usb video dermatoscope camera, 500x magnification skin camera, 500x usb video dermatoscope camera and 800x magnification skin camera. 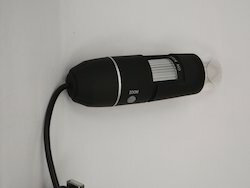 MEDICAM's USB VIDEO DERMATOSCOPE is a full-fledged Camera system to view Skin, Scalp, Hair etc. at a very high level of magnification & resolution. The images through this Dermatoscope are of extremely high resolution. It has a varifocal optical zoom lens which gives range of magnification level from 10 x to 200 x. 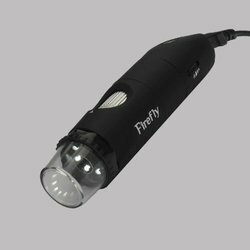 It has a built in light source for illumination. The scope is extremely light weight and very easy to operate .This machine can be attached to P.C. or Laptop etc. HMCS[Hemant Medicam Imaging Software] imaging software is provided with the USB Video dermatoscope to store patient's data & images. 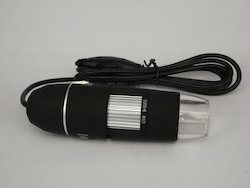 Able to analyze Skin or hair problem. Keep record of Pre- Post treatment photos & Microscopic images. Reveal professional image of your services. To observe Skin, hair, nail etc. under high level of magnification . To demonstrate minor improvement in Skin lesion of the patient. To Keep photographic record of the patient's regular follow-up. To keep clinical record of research drug trials. As a tool for teaching medical students. To store Clinical Data Base. Variable magnification levels from 10 x to 200 x.
Attachment to P.C & Laptop on USB port. Illumination – LED lights source. Magnification Ratio- 10x to 200x. Lens- Dual Axis 27X&100X Microscope lens. Power supply- 5v DC from USB part. Shutter Speed-1sec. to 1/1000 sec. Our organization is enlisted among the leading names in the industry, offering a wide assortment of 200X USB Video Dermatoscope Camera to the customers. The video cameras we are offering are widely admired by the clients for their availability in variety of sizes and specifications. Offered collection of video camera is assembled from the finest quality components by applying the progressive technology. These cameras are also quality approved on numerous parameters of the quality. 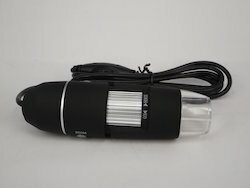 The 200X Magnification Skin Camera is a fully functional magnification device which can easily be operated by plugging directly into your computer enabling you to magnify objects up to 200x. 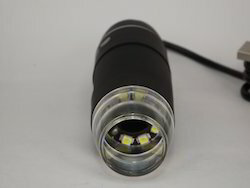 Enhanced with adjustable light control wheel with 6 white LED lights and a 2.0MP digital camera, the USB Microscope can capture high quality images and videos (AVI).